The corner of 17th Street and Folsom is a magnet for water when it rains. Perhaps the water remembers where it belongs. More than 100 years ago, the area now known as San Francisco’s Mission District was a vast marsh where frogs splashed and croaked, tules swished in the winds and ducks peacefully floated. The headwaters of Mission Creek met with a tidal inlet, forming a pool whose center was right where 17th and Folsom cross today. For many who walk these streets daily, what’s underneath has been long forgotten. But there are some in the Mission District community who have advocated for years to turn the empty lot into reminder of what the city looked like in its past. Last month, that corner took on new life, harkening back to a bygone landscape with the opening of the new In Chan Kaajal community park. The 31,850-square-foot park holds a community garden, outdoor amphitheater, fitness equipment and a playground. It also features art installations and a water fountain commemorating Mission Creek and the water that once passed below. The designers of the park decided early on that celebrating the Mission District’s natural and cultural history would be central to the project’s mission. The park’s name, revealed at the opening, means “my little town” in Mayan, honoring the community of Mayans who reside there. He says the installations acknowledge the juxtaposition of urban culture and the natural environment. “This is our natural history,” he says and reconnecting with it means reconnecting with the natural landscape. Carlsson, who runs online local history archives FoundSF.org and Shaping San Francisco, says there were no flat areas in San Francisco at all before European settlers arrived. Instead, there were sand dunes, ridges, freshwater ponds, natural springs and long stretches of swampy wetlands like those that comprised the Mission. A tidal inlet from Mission Bay drew seawater up to the tidal pool, while the headwaters of Mission Creek cascaded down a steep dropoff, traveling down 18th Street on its way to the tidal pool and Mission Bay beyond. The topography remains the same—steep streets now line these hills. But the natural waterways have vanished. The Ohlone and other native tribes gathered here, sustained by the rich offerings such as the salmon runs and the acorn bounty. When settlers first arrived, they hand carried water in buckets from a spring at Corbett and Clayton streets. Cattle ranches dotted the landscape before the Mission developed into a San Francisco suburb, its appeal bolstered by the new streetcars that could easily whisk workers to the city. 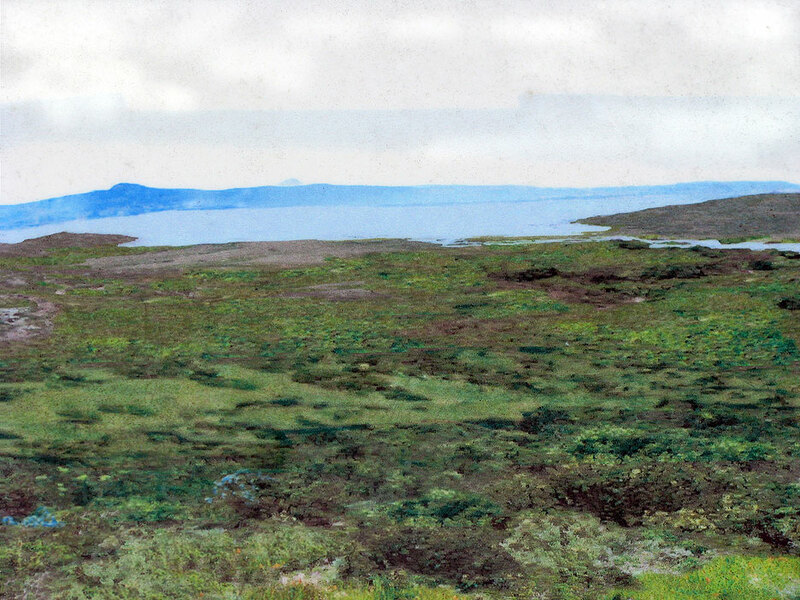 The wetlands were soon paved over, the creek confined to culverts and Mission Bay filled in. But the landscape’s legacy remained: Mission Creek is the reason the street grid takes the curve it does at 11th and Mission streets. And, Carlsson says, cyclists find that the easiest, most natural bike routes often trace the wiggles of buried streams. The former marshland proved an unsteady foundation for the budding town. When the 1906 earthquake struck, the tremors lashed cracks in the Mission streets built on soft, wet soil. 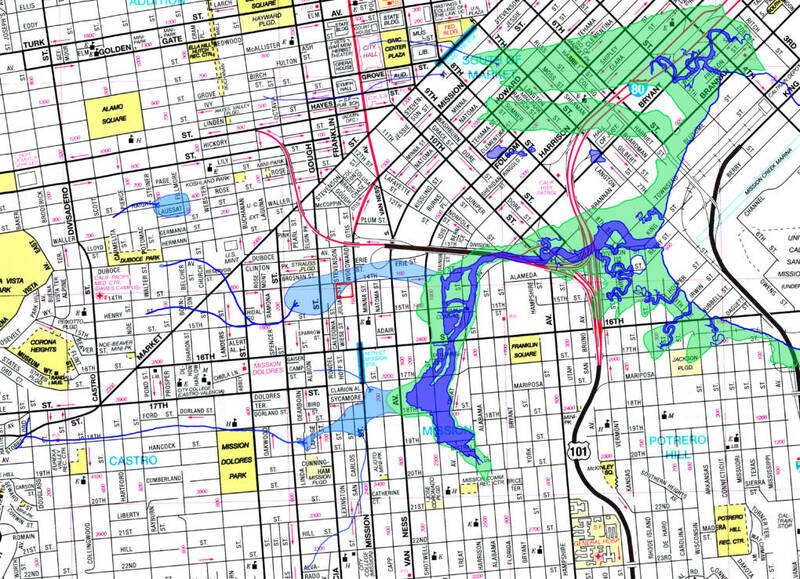 According to Olmsted’s book, the trail of collapsed buildings lined up with the old channel of Mission Creek. San Francisco artist Carmen Lomas Garza drew inspiration from the area’s natural history when developing what would become two larger-than-life iron cutouts worked into In Chan Kaajal’s fencing. The great blue heron she created carries a bare twig in its beak with which to line its nest, a behavior Garza herself has seen in the local heron population. California condors were also native to San Francisco, once scanning the luscious wetlands for a quick meal. The iron cutouts – funded by the San Francisco Arts Commission - recall not just the landscape, but also the indigenous people who revered these birds as symbolizing their elders. The water resurfaces in the park through a long trough-like fountain split in two. Visitors can walk between them. Each section has a series of fountains that send thin jets of water arcing down the trough. It’s low enough for children to climb upon and splash down the troughs. The fountains turn on and off with the press of a button. 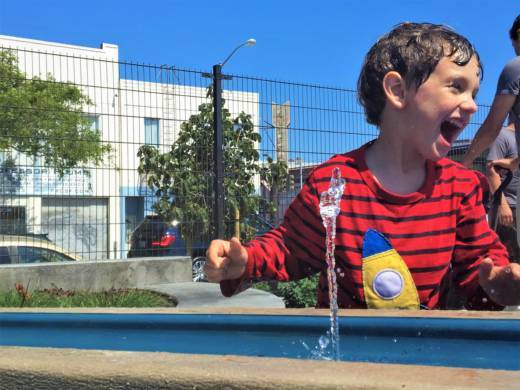 The opening ceremony took place earlier this summer on a relentlessly sunny afternoon, and local kids found the fountain irresistible. They splashed, shrieked and soaked themselves and anyone within a surprising range. Though Mission Creek may today be confined to culverts, In Chan Kaajal has brought water back to the surface, though that may mean splashing a few unsuspecting passersby. “I think you gotta wear a rain jacket when you go to that park,” Grande joked.